This easy Chicken and Rice Bake has just 7 ingredients and is so easy to customize! Get a healthy dinner on the table with minimal effort and maximum flavor. I know sometimes, from Halloween on, it might be hard to dig ourselves out of our holiday brains to think about getting dinner on the table. When really all I want is to bake cookies and sip hot chocolate, I turn to easy, healthy dinner recipes like this Chicken and Rice Bake to keep us fed. It has just 7 ingredients, and one of them is salt so that doesn’t even really count, right? It has tons of flavor thanks to pre-mixed spice blends, which also makes this chicken rice bake ridiculously easy to customize. Simply add whatever blends your family loves and stick it in the oven! 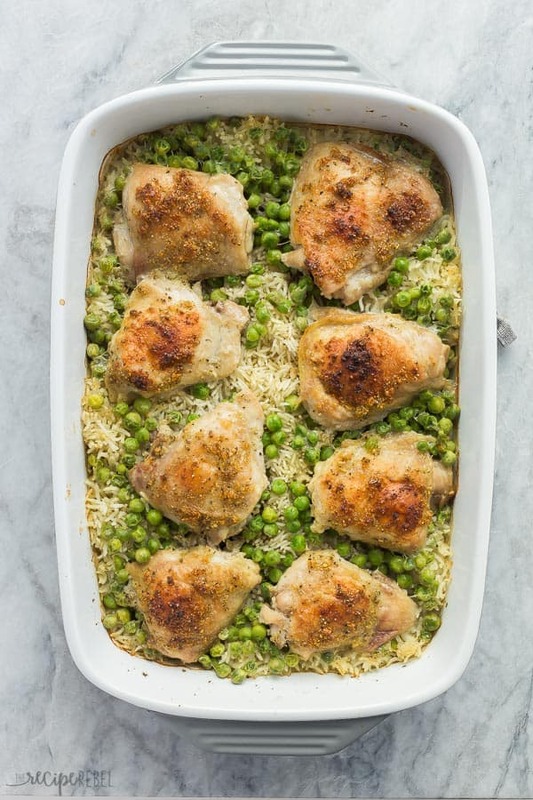 The brains behind this beauty of a chicken rice casserole is my friend Julia of the web site Imagelicious — I first met her at a conference a couple years back and am so glad I did! 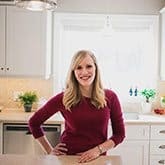 Her recipes are practical and delicious, and her photography is beautiful. Her cookbook, The Ultimate One-Pan Oven Cookbook, came out a couple months ago and I just got my copy in the mail! 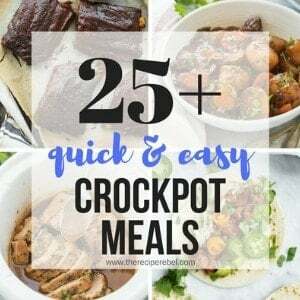 I had a hard time deciding on something to share with you, as we are all about easy, one pan meals here at TRR. Ultimately, I let you decide! It was a toss up between the Ricotta Cheesecake Pancakes (oven baked so no flipping!) 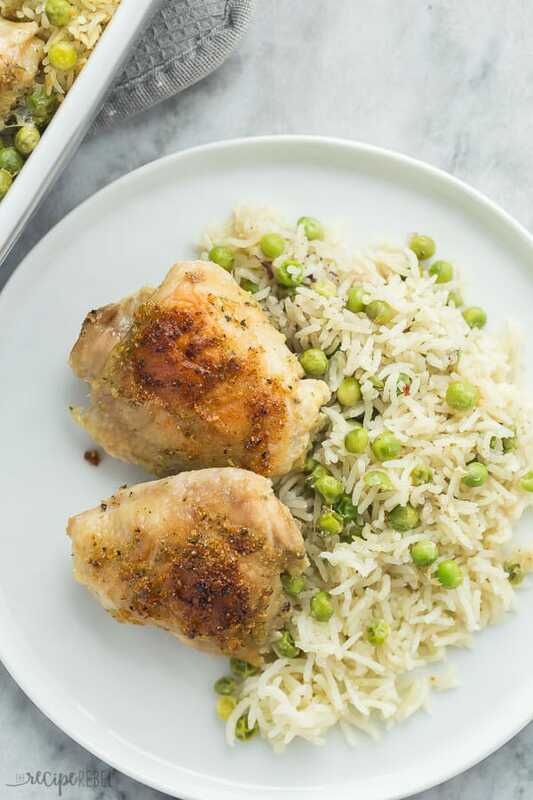 and this One-Pan Chicken and Rice with Peas, and you decided on dinner. 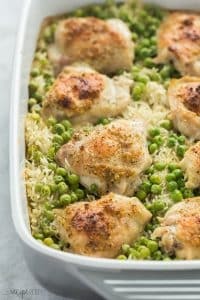 I’m not mad about it, because this is one easy Chicken and Rice bake that I want to keep in my back pocket! There are times to improvise, and times to follow the recipe. Basmati rice and bone-in chicken thighs are called for in this recipe because the cook times line up well and keep the recipe as simple as possible. Because we’re going to broil the chicken at the end of the bake time, we get to skip any searing before we bake. I’m all for this as it saves me having another pan to wash! Be sure to spread the rice and peas out evenly in the pan for consistent cooking. Use a deep, 9×13″ baking dish for this recipe, as it will be easier to maneuver if it’s not overfull. In the cookbook, Julia mentions she has made this with drumsticks, skinless thighs and chicken breasts as well, but prefers bone-in, skin-on chicken thighs. So other forms of chicken may work, but the results may not be quite as good (especially since the rice requires a long bake time). Julia also mentions that you can sub out the peas for other frozen vegetables. If you prefer, you can also leave out the vegetables and serve with a salad or additional vegetables on the side. Feel free to get crazy with the seasoning — try Cajun, Italian, or other varieties and blends! Because the recipe is simple and straightforward, you can mix up the seasoning without worrying about conflicting flavors. If you’re not a fan of mayo, try mixing the last 2 teaspoons of seasoning with some melted butter and brushing onto the chicken thighs before baking. Preheat oven to 400 degrees F. Add the uncooked rice and frozen peas to a 9x13" baking dish or roasting pan (3 quart capacity) with 2 teaspoons of the seasoning and the salt. Stir to combine. Arrange chicken thighs over the rice, skin side up (trying to leave as much of the skin out of the liquid as possible). In a small bowl, combine the remaining 2 teaspoons of seasoning with mayo and brush the mixture over the chicken thighs. Pout the boiling chicken stock into the pan around the chicken. Bake for 45 minutes at 400 degrees F, or until rice is tender and chicken reaches 165 degrees F or more in the deepest part. Broil for 2-3 minutes to crisp up the chicken skin, but watch carefully so that it doesn't burn. Serve. *I've found this recipe makes 4 large servings, or 8 small servings, so it will likely feed between 4 and 8 people. 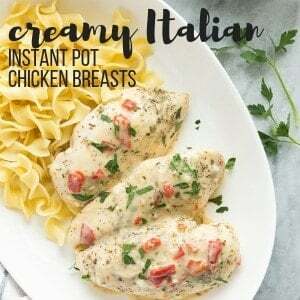 This was such an easy meal to make and everyone loved it! This is the perfect dinner idea!!! I am loving everything about it . Sounds so delicious! 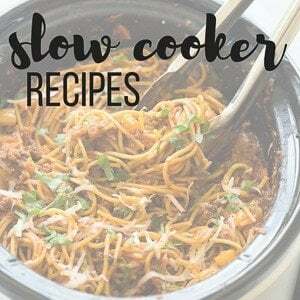 This recipe was perfect to make for a busy night! Thanks! Thanks Steph! I love how quickly it comes together! This was a huge hit with my family! Love how easy and delicious this is! This is so good! Our whole fam loved it! Thanks Sarah! I’m so glad to hear that! Sooo, I have boneless skin-ON breasts and would like to use brown rice. Any recommendations on shifting cook times? I made the recipe as is a couple weeks ago and loved it. Just trying to use what I have in the house. Thanks! Hi Rachel! I’m so glad you liked it! Brown rice usually takes about an hour in the oven, and the chicken breasts would be overcooked by then. I would probably start the rice, then give it a stir half an hour or 40 minutes in, top with the chicken and continue baking until it was done. I hope that helps! Yes! That’s about what I was thinking. Just needed some validation. ? Thank you! Which flavor of Mrs Dash did you use? I used the no salt Garlic Herb one! Some days you should just check your spelling. I meant bone-in skin-on chicken BREASTS. Also, what would the cooking time be for using the breasts? Thanks. Hi Vonnie! I haven’t personally tried but yes it’s possible! I would start with the original cook time, then check the temperature of the chicken and add time if needed. Let me know if you try it and how it goes! 1. I used 2 1/2 cups Better than Bouillon Chicken Base which I heated up in my microwave to make sure that the chicken base was well incorporated with the water. I use this because there is no added MSG in it and I am highly allergic to added MSG – it can put me in the hospital. 2. I added 1 Tablespoon of minced garlic. I baked it for 50 minutes and that is when my instant thermometer read the required 165 degrees F.
Great recipe. Will definitely make it again. Can you use bone-in chicken breats for this recipe? I’m not a fan of thighs. Thank you so much for your amazing words and review and such beautiful photos (better than the ones I have in the book, haha). I am glad you liked the recipe 🙂 Thank you! Thanks Julia! We are loving the cookbook so far — we’re always on the lookout for more easy dinner recipes and love all the variety!